Home Wildflower Seas... Texas Bluebell Gentian, a True Texas Beauty! Bluebell Gentian, a True Texas Beauty! Eustoma exaltatum ssp. 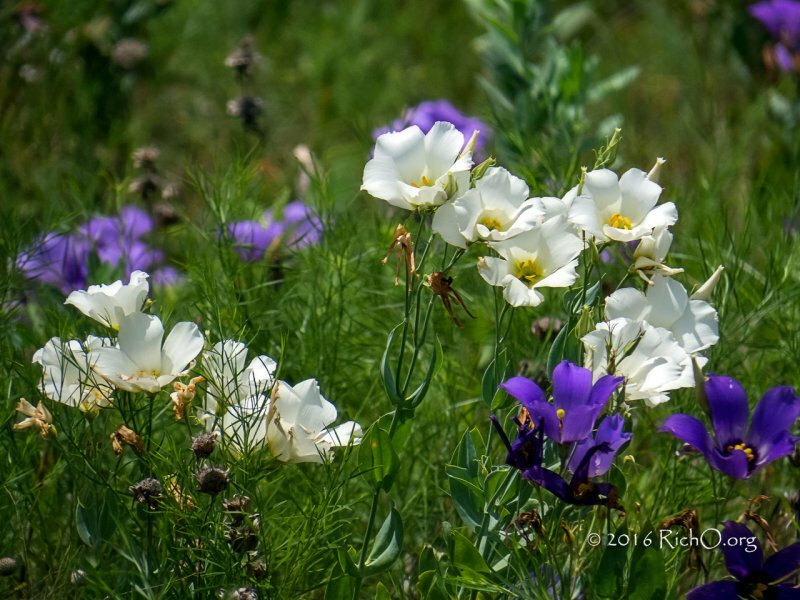 Russellianum (Eustoma grandiflorum or Eustoma russellianum) Texas bluebell, bluebell gentian, prairie gentian, bluebell. The family name, “Gentiana” apparently is a tribute to Gentius, king of Illyria who reportedly discovered the toxic properties of the plant. However, the medicinal uses of the gentian plants date back 5,000 years both in Asia and Europe. The plant’s root has been used for anti-fungal, anti-inflammatory, digestives and fever. Due to its digestive medicinal use and bitter taste it is one of the ingredients used in cocktail and digestive bitters. A number of legends and other folklore surround the gentian. One relates the story of King Ladislaus of Hungary shooting an arrow into the air praying God would direct the arrow to a plant that would help his people fight off the plague. The arrow landed and pierced the root of the Cruciata (Gentian). The Gentian root proved to be have amazing curative powers for those stricken with the plague. 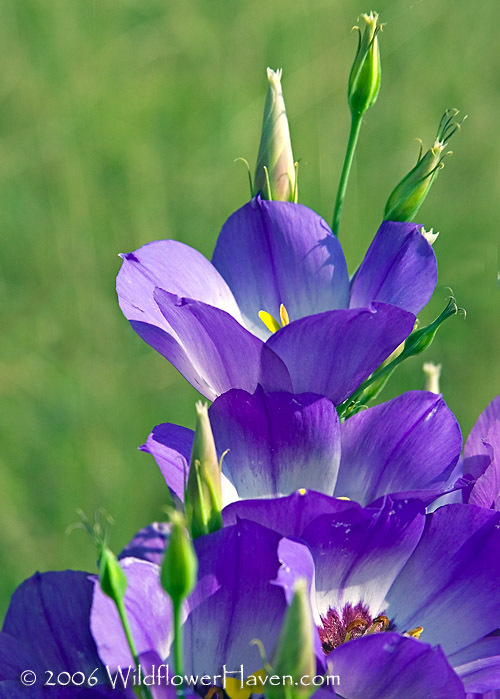 Another legend explains why some of the gentian species have blooms that open and close. According to this story, all gentians remained close until a fairy queen requested a gentian to open its bloom so that the queen could have a safe place to spend the night. The gentian opened its bloom and gave refuge to the fairy queen. As a reward for the gentian’s hospitality, the fairy queen conveyed upon the gentian the ability to open fresh each morning. In Japan and China, the cultivated blue gentian lisianthus (synonym for the Eustoma exaltatum) is highly revered and often placed on the graves of loved ones. In 2012, a botanist from Japan contacted me for help in finding them here in Texas. He traveled all the way from Japan, just to locate and photograph them in the wild. Once found throughout Texas, but due to their beauty as cut flowers, the bluebell is now so uncommon that each year, we conduct a hunt for them. Most often the bluebell gentian is found in areas with a bit more moisture and some protection from harsh sunlight. This usually includes creek and river banks or along drainage areas. Over the years, I have found them in Kendall County and Kerr County in the Hill Country. Some have been located near Cranfills Gap and Clifton in Bosque County. I have also located some near the intersection of Texas 220 and US 67 just west of Glen Rose, Texas. In 2016, I saw photos of them in the Austin area. Naturally, one of the regions where it is found is where Blue Bell Creameries which is located in the Brenham area. (http://www.bluebell.com). The most reliable route has been along FM-390 from Burton, Texas to Texas 105. I hesitate giving out specific locations for fear some will actually go and remove blooms from plants before they seed. If you think that is being overly cautious, think again. One year we had a bonanza of the bluebells in the Brenham area. Some of the locals had actually reported thefts of the blooms. None of this is verified, but not that unlikely. Gentian blooms are best found in mid to late June through the 2nd week of July. In my gallery at http://www.pbase.com/richo/bluebells , you can find photos of bluebell gentians that I have found and photographed.